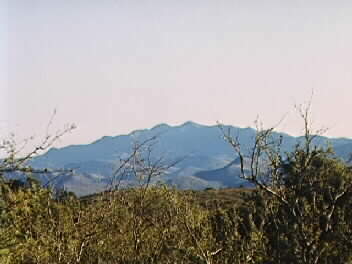 This is a view of the Apache Mountains about 30 miles north of Globe. They are called Bich'i £éhe in Apache, "flee to the hills," as it was towards these mountains that the Apaches fled when pursued by the U.S. Army. One of the 5 bands of the "San Carlos Apaches" was centered in this area. Their leader was Talkalai, who became a famous scout for General George Crook. Talkalai lived to 1930 and is buried in Pinal Cemetery in Central Heights (between Globe and Miami).